Make a right path for your business by targeting the right people at the right time. interact and transact with your target audience. Automate web-based platform avoids the need of any installation and download. API facilities allow usage of sms service more efficiently. past and complete statistics here. You can create a message template for transactional or OTP route. Template should be approved by the admin. You can select English language for English message Or Unicode language for other language message. Dynamic SMS like "Hi Ravi, Your salary 45,584 INR is credited in your Account." Here Name "Ravi" & Amount of salary "45,584" are dynamic values that collected from contact list. Add smart URL in your text message and easily redirect your target audience to the desired landing page. You can also track the click through rate. Create a sender ID for transactional, OTP and Enterprise route. It must be either 6 digits or characters. Admin will approve it. 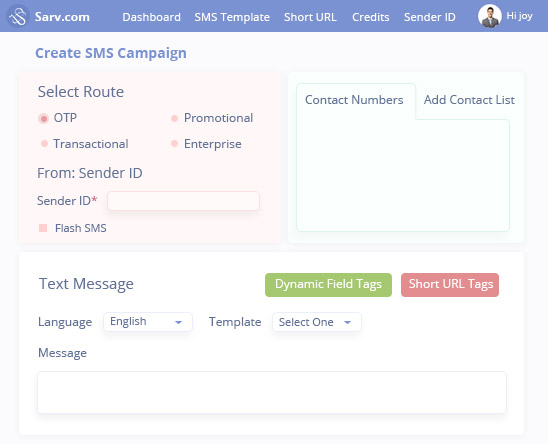 Powerful panel is able to send more than 5 Million SMS in single campaign. We offer you the liberty to transmit 5000 TPS (Transaction Per Second) to your target audience. Reseller is able to Oversell SMS. SMS credits deducted only if customers of reseller send SMS. Reseller can choose customer's biling type. Select your route, give SMPP a name, and enter your whitelist IP. Reseller also able to resell SMPP services. Create contact list and upload file of your prospects (.csv, .xls, or zip format). Create your custom fields at one place. No need to create them separately for each contact list. You can link the custom fields with your contact lists. You’ll get a free missed call number that will help you to take your communication to the next level. Schedule your campaign on specific date/time and the automated system will send your campaign. You can segment your contacts into groups and send your message to specific groups. Everything is searchable in SMS application. To narrow down the scope of your search, filter your report by clicking on search icon. More than 90% of all SMS messages are opened and read by the recipients. It can bring great success. It has high conversion rate and more actions are taken by customers than other marketing channels.